An unique, one of a kind place, perhaps the only one in the world that uses the traditional Indian motifs alongside European art techniques to create world-class jewellery. Ikroop, the designer behind this brand has learnt the nuances of glass art from the master himself, Atul Bakshi, the best glass artist in all of India, though her first brush with this was in Murano, Italy itself. What will you find at Ikroop? The jewellery is created using a world renowned Glass fusion technique known as ‘Murano’ . This technique involves heating the glass to over thousand degrees into a molten state which then leads to creation of a various shapes with bursts of colour. No two pieces are identical because of the method used in its creation and hence this jewellery is lovingly put under the category of wearable art. This glass masterpiece is then encased using the traditional ‘karigari’ skills in brass and then gold-plated (18.5 carat) to achieve a contemporary look and feel. Infact, we had written about another designer (Razia Kunj), creating wearable art, not long back. 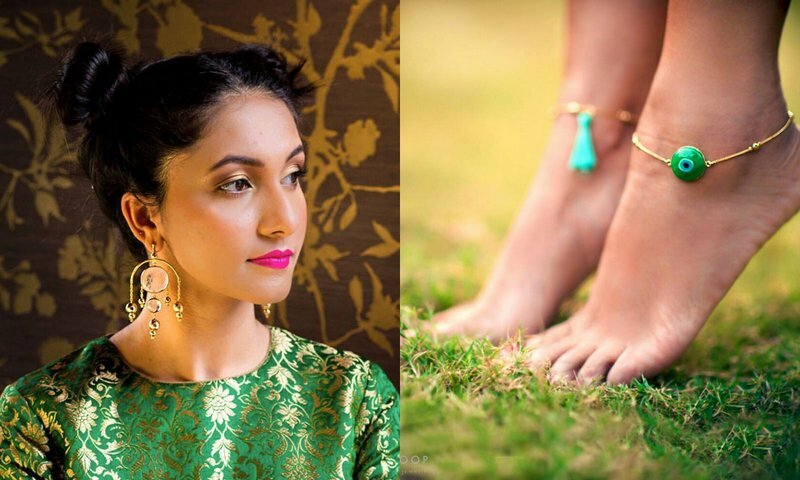 Have a peep into Razia Kunj’s designs (by clicking here), and be amazed at the difference in styles of Ikroop’s and that of Razia’s. 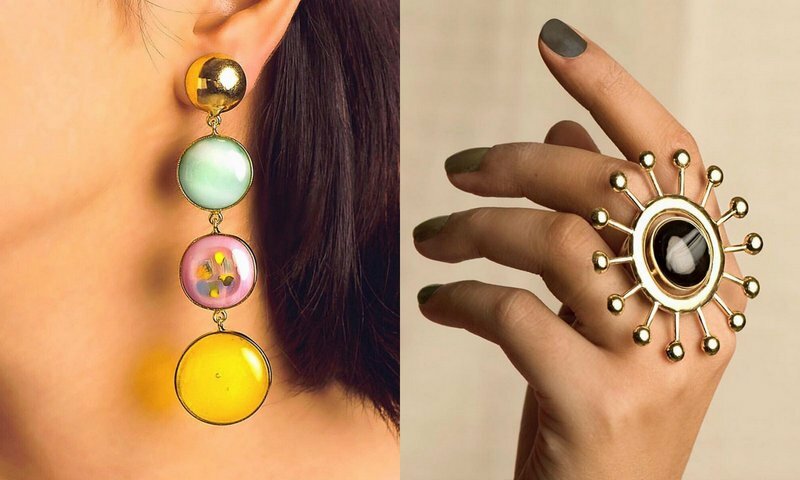 Both wearable art, both gorgeous, but that’s where the similarities end. Glass is a versatile medium and it offers endless possibilities to the artist. Stained glass is beautiful and is present in churches and chapels across the world. 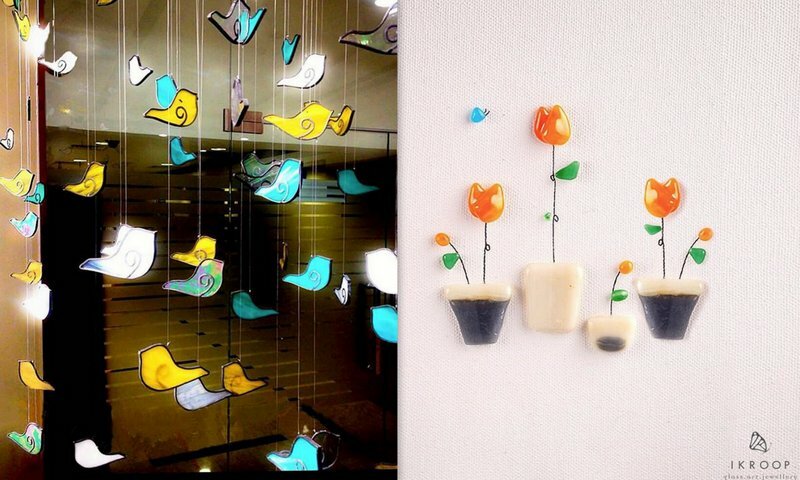 The Ikroop studio creates contemporary art accents using the same technique (copper taping and lead lining) to create bespoke art installations as well as fused glass canvas stories. Where can you buy Ikroop from? 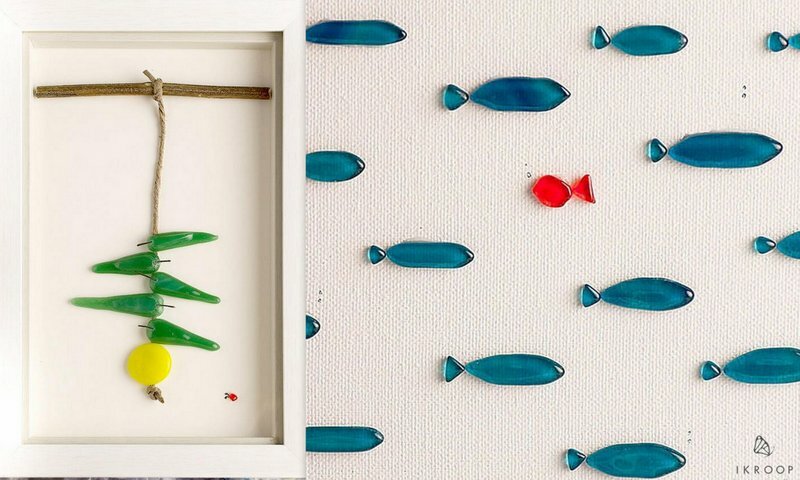 If you are looking to have a little bit of ‘glass prettiness’ in your life, then do have a look at the magnificence created by this glass artist. Ikroop welcomes interns, so do have a little chat if that’s what you are after. They will be participating in The Pink Post Inc, Delhi and the Enchanted Garden, Kolkata events in the coming months. So, do keep an eye out and treat yourself to some glass gorgeousness. Love glass in all its forms …Be Notjustashopper! Your webpage is very interesting with young stuff and designers. Thanks for sharing its awesome .